Just Romantic Suspense: HOT NEW SERIES! Congratulations to "Kenra M.", the winner in Susan's giveaway. Thank you to all who participated! I’m so thrilled to be here. Thank you so much for inviting me! I’ve just seen my 51st book hit the shelves, and have been answering a lot of questions. What’s the best thing about writing romance, for example? The readers, of course! Meeting people across the world is a bonus I never imagined when I signed my first contract, and the Internet has brought us all closer together. When I attended RWA San Diego this year the first person to ask me to sign a book said it was about time I wrote more polo books like my best-selling Acosta series. I just love her for that. I love my polo players and I love my readers, so I came home and started writing straight away. A new series is born! 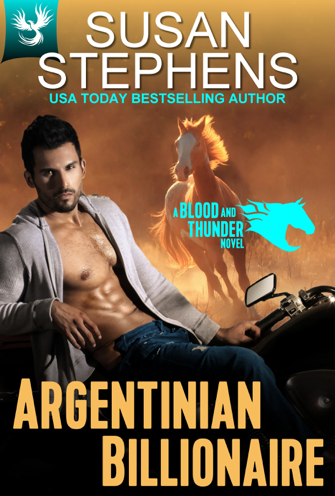 My brand new Blood and Thunder series is a collection of stand-alone, no-holds-barred romance stories, set in the tough, unforgiving world of top-class polo—billionaire cowboys, as I always think of them. There’s plenty of passion and danger, as well as steamy action and fiery, stand-up heroines to deal with those arrogant men. Here’s the first novel in the series—available for purchase November 8th. Up for pre-order now! 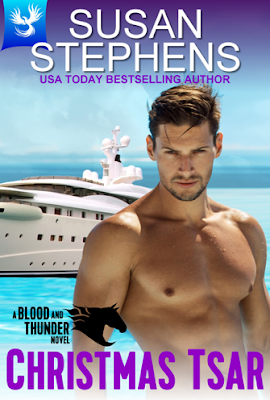 Isn’t the cover great—the guy’s so hot! This is my Russian billionaire hero, Alexei Riga. “On the bed,” Alexei instructed as he backed her across the stateroom. “Enough to distract you?” she suggested. “Then, I guess I’ll take now,” she said, trying to sound equally offhand. Amber fired him up like no other woman before her. He’d never met a woman so dismissive, so provocative, or so challenging. His natural male desire to master, tame, and pleasure was eating him alive. And every inch of the way, she threw up a challenge. He liked that. “You just want the act and satisfaction,” she accused him. “Don’t analyze. Just feel,” he advised, running his hands very lightly over her for the pleasure of feeling her tremble beneath his touch. “Are you determined to tease me?” she demanded huskily. “What do you think?” he murmured, kissing his way down her neck. “I think you’re stone here…” She touched his chest over his heart. "And what’s the cure for that?” he demanded softly. "Turn up the heat?” she suggested. My Romani Chieftain, Dante Formosa, is the billionaire hero of Argentinian Billionaire, and he is hot, hot, hot!! Pre-order now. Release date January 17th 2017. I’ve had the best fun writing these red-hot romantic suspense stories, and I hope you enjoy them as much as I do. Please don’t be shy. Join those I chat with on a regular basis on my Facebook page and on Twitter. The romance world is such a happy community, that whatever else is going on in our lives, we can all reach out and escape for just a while, either by reading a new book, or by chatting with other fans of the genre. Having the opportunity to chat with you has been great. Let this be just the start! I'll be giving away a signed copy of my latest Presents novel, A Diamond for Del Rio’s Housekeeper, together with Susan Stephens swag, and a special little gift just for you. This giveaway is available globally so that no one is excluded. Giveaway ends 11:59pm EST Nov. 10th. Please supply your email in the post. You may use spaces or full text for security. (ex. jsmith at gmail dot com) If you do not wish to supply your email, or have trouble posting, please email maureen@justromanticsuspense.com with a subject title of JRS GIVEAWAY to be entered in the current giveaway. Sounds very interesting. I enjoyed the excerpt. Thanks Debby :) That's great news! I always enjoy your books but I love the sounds of this new series, definitely on my wish list now. Love the sound of this series! Congrats on book 51! Thank you so much for your congratulations Colleen. I can hardly believe it myself! Congrats on your 51st book!! That's quite an accomplishment!! And lots more planned and on the way! Sounds great. Love the new twist. Thanks :) I've loved writing something a little different, but with the same hot, hard, wealthy men - and strong, feisty heroines, of course! Thank you Kenra. All the very best to you! Love the excerpt - great covers. The covers are hot. Congratulations on your 51st.